Wernigerode is a gem, filled with street after street of half-timbered houses. The best part is wandering around the old town (Altstadt) soaking up the atmosphere. The Gothic town hall (Rathaus) was built in the 16th century and is an impressive (and orange) building. It is on the main square along with houses built by the more prosperous town burghers. 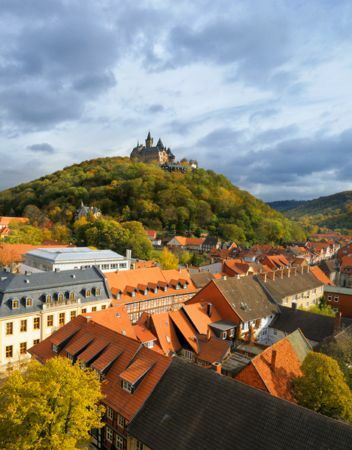 Like most of these small towns in the Harz, the main industry was mining silver and copper. Fortunately, most of these towns escaped the damage that fell upon many German cities during World War II. A walk down Breite Strasse, the long pedestrian-only street, is a pleasant way to see many of the elaborately-carved wooden homes. Of course you may have to take frequent breaks in the numerous restaurants, shops and sidewalk cafes that line the street. What you won't see are American tourists (no offense meant! I'm an American tourist myself. It's just nice to be among the locals for a change). At the southern end of the town is an area where the less well-to-do lived. 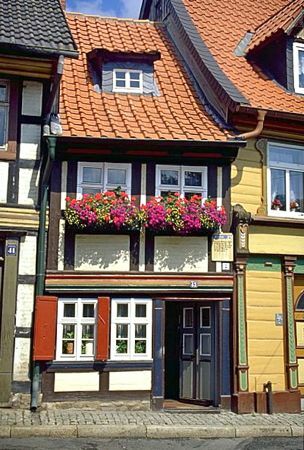 On Kochstrasse you can see a tiny house, the smallest in Wernigerode. The ground floor is one room and only about 10 meters square. The town is a terminus of Germany's largest network of narrow-gauge railways. These antique steam engines chug up and over the mountains, connecting the little villages of the Harz. The Brocken is the highest and most famous mountain in the Harz. 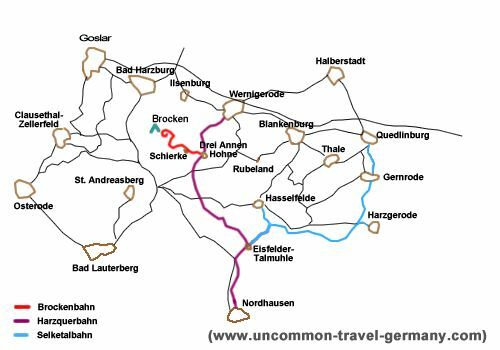 The only way up is either taking the steam train from Wernigerode (or towns further away, see map below) or walking. An attractive option is riding up to Schierke, the highest village on the mountain, and walking about two and one half hours from there to the summit. 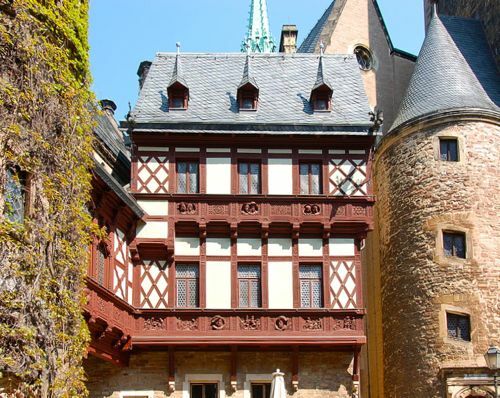 You can also take a bus up to Schierke from Wernigerode. Above Schierke, it is either the train or on foot. Click here for information on hiking from Schierke and things to see and do at the top. 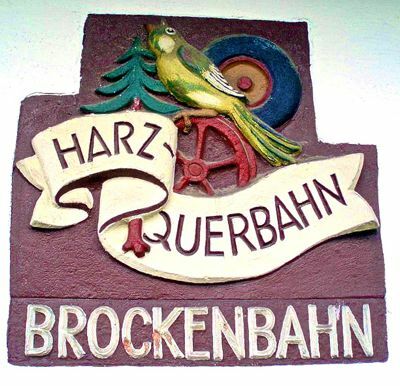 The Harzquerbahn (one branch of the steam train) goes through the old town. You can get on at the main train station, but the best spot is the Westentor stop, just outside the old city gate on the western edge of the old town. 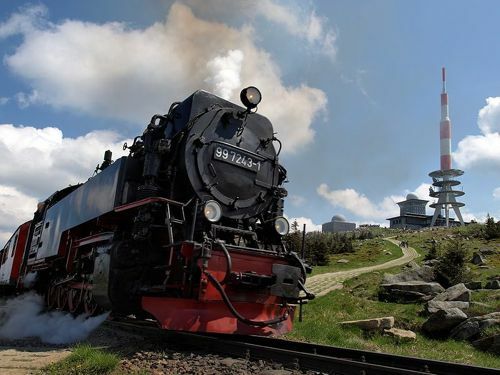 The ride up to the Brocken from Wernigerode takes about 1 hour and 40 minutes. You change trains at the Drei Annen Hohne station part way up. Get on the Brockenbahn steam train which goes all the way to the top of the mountain. The trains run all year; a ride in the winter snow is quite beautiful as well. From the top you have a great view of the Harz area. There is a hotel and restaurant at the summit, along with a theater, botanical garden and an exhibit about the history of the Brocken. 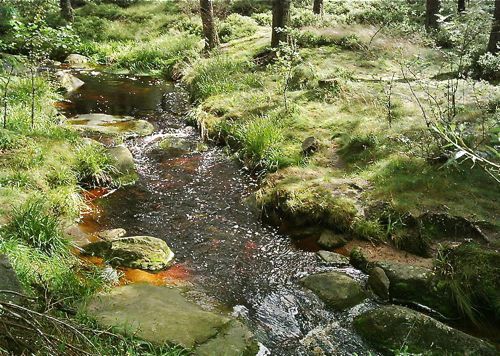 Steeped in legend, the Brocken was long believed to be a meeting place for witches. Goethe set a famous scene from Faust on the Brocken during Walpurgis Night. 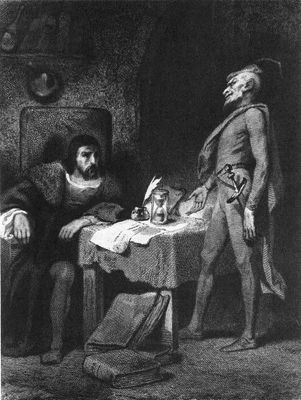 Mephistopheles takes Faust up on the mountain to join the witches in their revels. Must be forever lost from sight. He'll never fly, who won't today. 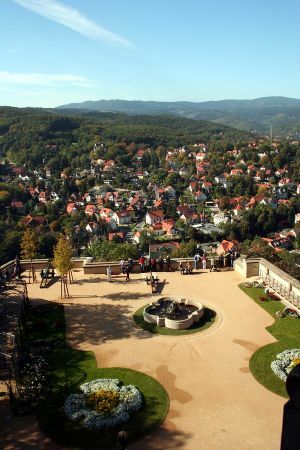 The Brocken and Wernigerode ended up just inside the border of East Germany at the end of the war. Because of its height and location, it was a major spy station during the Cold War. Listening devices on the mountain were aimed at West Germany and travel into the area was strictly verboten. Sitting above the town is a lovely medieval castle, with gargoyles guarding the approach. Head up there for a beautiful view of the town. You can tour the castle and look across at the Brocken. 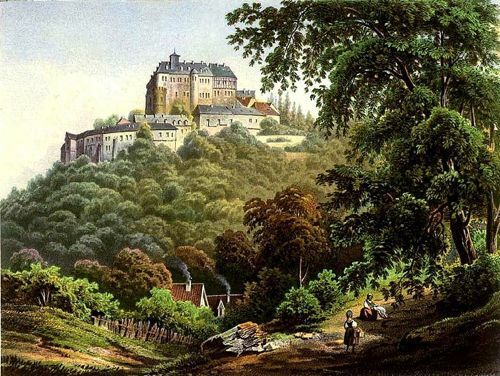 The castle was built in the 12th century and was the seat of the Counts of Stolberg, until the communist government confiscated it in 1945. It is now a museum, and has been kept as it was when acquired from the family. The interior of the castle contains room after room of exquisite medieval furnishings and tapestries and beautiful wood carvings. It's even available for weddings and receptions. The walk from the Markt to the castle is about 30 minutes, with a steep approach. Trams are available, also. The tourist office is at Nicolaiplatz 1. This is a good first stop when you arrive at the town. They can tell you what's available in hotels and make the arrangements, if you don't already have reservations. You can pick up a map and some brochures about the town and nearby attractions. If you didn't get a steam train schedule when you were in the main station, you can get it here. Cafe Wien on the Breite Strasse. Pretty spot for dessert. 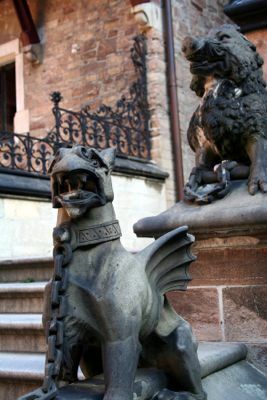 Ratskeller in the Rathaus. Right in city hall on the Markt (main square). 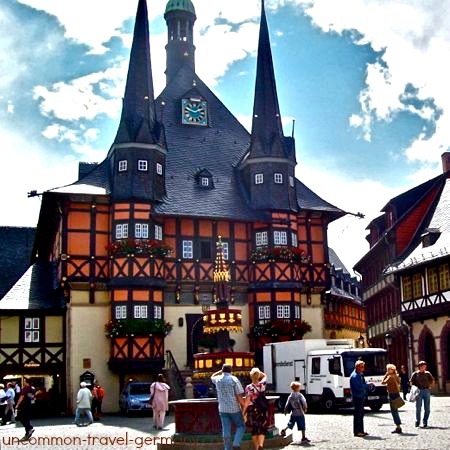 Click here for tips on traveling to Wernigerode and maps of the Harz.